I all does seem to have happened very quickly. I would imagine that the spate of cancelled matches has been a factor. The pitch at Myreside clearly does not seem to be up to it and presumably if they were to stay there longer term, would be looking at having to put in a 4G pitch there as well. The fact that both sides appear happy to walk away from the arrangement, having had a three year deal on the table suggests that there is a realisation that it is just not working out. I can understand the state of the pitch changing their mind for next season and beyond, but with the weather getting warmer it shouldn't make a big difference for the rest of this season so it is strange to abandon mid-season. Trouble is the whole project has lost momentum with the cancellations. Of the up coming games, the cup game will go to Murrayfield for the crowd as will the last leg of the 1872 cup. How many home games does that actually leave? Chopping and changing every week is a lot worse than making a decision and cutting your loses and that is what would be going on if they stayed for the rest of the season. It was certainly worthy of trying out at Myreside, but it just does not seem to have worked out. Maybe it is best just to recognise that. We've got Leinster, Munster, Ulster and Scarlets at home before finishing with Glasgow - so the teams that usually attract the biggest crowds. In a way that makes the move to Murrayfield a bit better as the stadium wouldn't be quite as empty as 3500 people watching the Dragons say, but then again these are the games where you could have packed out Myreside and really built momentum for Edinburgh making it a permanent home. 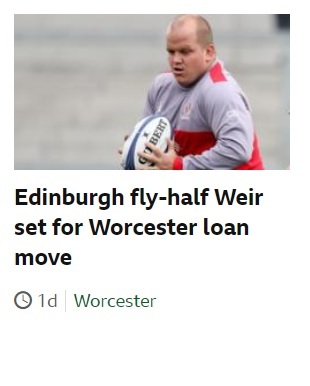 Edinburgh tweeted that Weir will go on loan to Worcester next week, as someone mentioned earlier in the week. Says it all that we only have one fit standoff and he still doesn't get in the team! I assume it's with the view to a perm move, given he's out of contract this season. To be fair he suits the Solomons gameplan perfectly! In theory yes, but in reality I'm not sure he will. His strength is based upon a kicking game, but that has been pretty average for a while now. He might flourish down there, but I suspect not. Bit of a last chance saloon for Duncy. Cockers clearly has no use for him at Edinburgh, especially with VDW seemingly playing well and the Kiwi arriving next year. Lets hope he hits his straps down there, if it does not go well, then his future as a professional rugby player may be looking a bit bleak. What happened with Duncan Weir? Did he do something naughty? Does Cockers not like his play style? Is he just Poopie? Is Tovey in that bad books too? It's been a long time since Alex Grove has been at WW. He has been plying his trade in National League 1 for the last couple of seasons. I believe he's at Coventry RFC now, after some time at Birmingham Moseley. After he left WW he was at London Scottish. Heathcote was playing well until multiple concussions sidelined him for a while. He may have to cut his career short. But as for Alex Grove's career, it went down hill after that spell at Edinburgh. It's a shame actually. He played at 12 for Scotland when we beat Australia in Australia for the first time in ages. I remember when Grove and Joe Ansbro were our new exciting centres. In that game Laidlaw played at 10... back when we were bereft of fly-halves. Speaking of poor Joe Ansbro, he was a fine player too. Broke his neck like Thom Evans. Which was in itself surprising considering he survived a "Glasgow Kiss" from Alastair Strokosch. Notice Duncy Weir signalling for chicken wings at the end of the clip. A Simply Mesmeric Try wrote: What happened with Duncan Weir? Did he do something naughty? Does Cockers not like his play style? Is he just Poopie? I searched on google and found this. You'd barely recognise him now. Dunno about bad books, I think he's been spending too much time in the stands next to the pie van and had a Britney moment with the clippers. He can be our 5 foot solution at tighthead. Lost a bit in all the excitement going on at Murrayfield today, but Mark Palmer was giving out the latest on contract comings and goings. CDP is not being offered a new contract by Edinburgh and so will be off. I guess with Barclay arriving and being on a decent wedge, someone had to give and CDP was always going to be the most likely. There are a lot of decent young back rowers at Edinburgh now and they will all be pushing for international honours and bigger contracts as time goes by. It will be interesting if this means that there is still room for Hardie or if Hamilton is going to come north as hinted previously. SHC has been offered a new contract but is not happy with it and is negotiating. Not sure if he will be staying or not. Truth is he has not done a lot to justify a vastly bigger contract. Probably a good decision to let CDP go - given his injury problems his best years aren't ahead of him. Hope he gets an offer elsewhere. Will be sad to see him go as for several seasons he was often the one shining light in a dismal Edinburgh team, almost winning games on his own at times. Who knows how good he would have been if it wasn't for his horror ankle injury, as before that he looked a special player indeed. For what it's worth I'd like SHC to stay, but not if it will break the bank! RDW_Scotland wrote: Probably a good decision to let CDP go - given his injury problems his best years aren't ahead of him. Hope he gets an offer elsewhere. Will be sad to see him go as for several seasons he was often the one shining light in a dismal Edinburgh team, almost winning games on his own at times. Who knows how good he would have been if it wasn't for his horror ankle injury, as before that he looked a special player indeed. Agree completely about CDP, looking at him now you forget how good he was before the injury. He was wasted in the Edinburgh team of that vintage. It's a real shame that injury has prevented him fulfilling his potential. I don't think Cockers has any intention of breaking the bank for SHC, the offer is more likely to be of the take it or leave it kind. He is not playing him often enough to show that he thinks he is indispensable. For what it is worth a move may be no bad thing for him, problem will be finding a club where he will get any meaningful game time. He is just not established enough to get a starting spot for any AP team down south. Taking what Edinburgh offer him may be his best (or only real option) for the moment but he really needs to establish himself as the starting SH, which you would imagine should not really be that hard. CDP, SHC, Weir and tovey announced as leaving Edinburgh. Although in an unfortunate twist they've had to recall Weir from his Worcester loan move due to a lack of 10 cover - he even said goodbye on twitter! Not sure how our position has changed as we didn't have a backup 10 last week. Not overly buying his excuse about remodelling the squad and evening out the forwards/backs split - he's going to have to replace each of the backs that have been released! 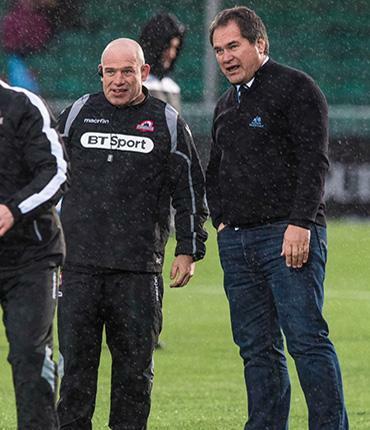 RDW_Scotland wrote: CDP, SHC, Weir and tovey announced as leaving Edinburgh. What? Why is Tovey going? He's good at that rugby stuff. Uncle Cockers wrote: But Duncan needs an opportunity and there’s an opportunity at Worcester. Now because he is a good man, we’ll let him take that opportunity, because he needs to go and find a new club. My only concern is that while SHC may not be the answer at 9 for Edinburgh, neither are Fowles or Kennedy! Scott Steele and/or Rory Brand from LI? Maybe Henry P making the journey eastwards? BigGee wrote: Scott Steele and/or Rory Brand from LI? Pyrgos may be appealing to add some needed leadership to the squad, but that would leave Glasgow needing to sign a 9! That would leave Glasgow with two starting 9s and Barletto from the academy, who seems very promising and not forgetting Niko, who is a nine by trade. One more up and coming/squad filler should be fine for us if Henry was to go. He is probably to good to be the third choice player at Glasgow. RDW_Scotland wrote: My only concern is that while SHC may not be the answer at 9 for Edinburgh, neither are Fowles or Kennedy! Offside line wrote: RICHARD COCKERILL says the make-up of his Edinburgh squad for next season is 99 per cent complete, and confirmed that there will be no room in that group – which he expects to be around 40 strong – for Scotland internationals Cornell du Preez, Sam Hidalgo-Clyne and Duncan Weir, or for Welsh playmaker Jason Tovey. The head coach was tight-lipped about the prospect of Scotland centre Matt Scott returning to the club after two years playing for Gloucester, but pointedly did not rule out that possibility. “I’m not in a position to confirm that at this point,” said Cockerill, when asked specifically about Scott being added to the playing roster during the summer. In a refreshingly frank press briefing, Cockerill shed light on the challenges he faces in trying to refresh the squad – in particular he wants to add firepower to his backline – whilst sticking within a fairly tight budget. “Cornell won’t be staying with us. We’ve got to get a balance to this squad across the forward pack and the backline. Cornell is a very valuable player in the market place – he’s a ball carrier who commands a decent salary – so we’ve decided that money can be spent across the group,” he explained. It is a similar story with Hidalgo-Clyne. As a talented and versatile back-line player who grew up in Edinburgh, he would appear to perfectly fit the profile of the type of individual Cockerill wants to have in his squad – but as The Offside Line reported on Monday morning, the player and the club could not quite get on the same page. The Offside Line also reported last week that Duncan Weir had joined Worcester Warriors on a loan deal but he has now been called back to Edinburgh ahead of being named in the squad for Friday night’s trip to Belfast to take on Ulster. Cockerill has confirmed, however, that the 26-year-old stand-off’s longer-term future lies away from the Scottish capital. “Duncan won’t be with us at the end of the season, he’s moving on, and there’s an opportunity for him at Worcester. It’s about giving him that opportunity. Unfortunately, because Tovey, [Phil] Burleigh and [Blair] Kinghorn are not available at the moment, I’m actually bringing Duncan back for this weekend because we need that coverage, we can’t expose ourselves for the next week or so,” he said. “It is not a short-term thing. We’ve got to remodel it a little bit at the end of this year, which we will, but we are looking to build the squad over the next three, four or five years to have some continuity and build some strength so we are able to compete,” Cockerill added. Cockerill added that he is not concerned about the upheaval caused by the various comings and goings in the squad. “I don’t think so because I’m just dead straight with the players. Those who are leaving, I’ve already had those conversations with, so it gives them four or five months to go and find alternative employment. For me, that is the right thing to do,” he explained. “They are Edinburgh players until they are not Edinburgh players, and if they earn their place in the team they will play,” he continued. It is great to have such an honest and open coach – the journalists must love it. Interestingly there’s a lot of interesting quotes there that none of the other newspapers or BBC have picked up on – I’m assuming to keep the word count down. Just noticed that George Horne has only signed on for another year - strange for a young player who has broken through into the first team? Possibly has garnered interest from other teams based on his time on the sevens circuit? RDW_Scotland wrote: Just noticed that George Horne has only signed on for another year - strange for a young player who has broken through into the first team? Maybe they just don't want him and Ali Price coming up for renewal at the same time. I would not read to much into it, he seems very happy and settled at Glasgow and is still pretty inexperienced to be attracting big money offers from elsewhere. If he establishes himself as an international in the next 12 months, he will be getting a much better offer from the SRU. Mark Palmer hinting that Denton will be heading off to Leicester for next season. That would be a decent move for him, he was touted for them before but it came to nothing. If he was to go, it would not surprise me to see CDP head down to Worcester. Solly seems quite happy to bring some of his old boys with him. That would be a great move for Denton - I've always thought Leicester are the club that suit him most and if he'd moved there instead of Bath his career may not have stalled so much. Would be good for CDP to move to Worcester too and Solly is definitely a fan of his. Solly even brought omar mouneimne to the club so he definitely goes for the tried and tested! CDP confirmed moving to Worcester, who also confirm that DD is leaving, but no destination given. Good to see CDP get a AP contract, he may be more suited to that kind of game these days. As bad as he was against Wales we can't afford to completely discard players to the scrap heap for Scotland - you never know, a move to another club and potential full fitness may make him an option for us in the future. Glad he got a new club in the prem, hopefully the change of scene works out for him. Hoyland gets another year at Edinburgh. Seems to have just slipped back a bit over the past year from being Edinburgh best option on the wing and pushing for international caps. Cockers clearly has not given up on him, but a one year contract probably reflects that he needs to up his game a bit more going forward. Duhan VDM signs a 2 year deal too - I've been impressed with him since he regained fitness at the start of the year. Big, powerful and fast - could be a real asset for us. RDW_Scotland wrote: Duhan VDM signs a 2 year deal too - I've been impressed with him since he regained fitness at the start of the year. Big, powerful and fast - could be a real asset for us. That will also take him over the 3 year residency period as well. Kinghorn has signed a 3 year deal as well. Let's hope he has more luck in injury than other project players. He is refreshingly honest in his ambition to play for Scotland due to the SARU problems - I must admit I wouldn't want to be playing for Saffers the state that its in at the moment, politically and form-wise. Shame for them but happy that a talented player is expressing interest in Scotland! Amazing to think Weir is still only 26. If he can get some form and actually get his kicking up to scratch, he may still have a good career and earn a few caps (unlikely as it seems right now). Preferred SHC to Fowles but really one had to go to get space for youngsters to come through. Being practical, neither are likely to be in the Scotland squad moving forward barring injuries (I know Fowles is at the moment as 4th choice). G Horne and Steele are improving (rapidly in Horne's case) and Vellacott could change his mind. Hopefully Bristol or Worcester pick up SHC. So CDP replaced with Barclay. Who else is leaving if there are too many forwards? Tovey and Weir are replaced by VDW and the NZer. So with VDM, Kinghorn and Hoyland signed up, and Fife and Graham already signed on, we've got pretty good back 3 options going forward. I'm assuming Harries will be off (he hasn't played in ages) and not sure if Tom Brown will get a contract - he's a club stalwart but not in the same class as the names mentioned above. Cockers doesn't seem the sentimental type so he may be let go. Thistle podcast hinting that Nel is on the point of making his comeback. It is just about 12 weeks since he broke his arm, which would sound about right. Can't imagine he would get chucked straight back into the Scotland team though but if he was to take a part this weekend, then maybe for the last two games. Cockers likes a bit of smoke and mirrors, so lets see when the team comes out tomorrow. BigGee wrote: Thistle podcast hinting that Nel is on the point of making his comeback. Would be harsh on Berghen too.